A down payment is the amount of cash you put toward the purchase of a home. Ten important factors you need to consider before you put a 20% down payment on your mortgage. 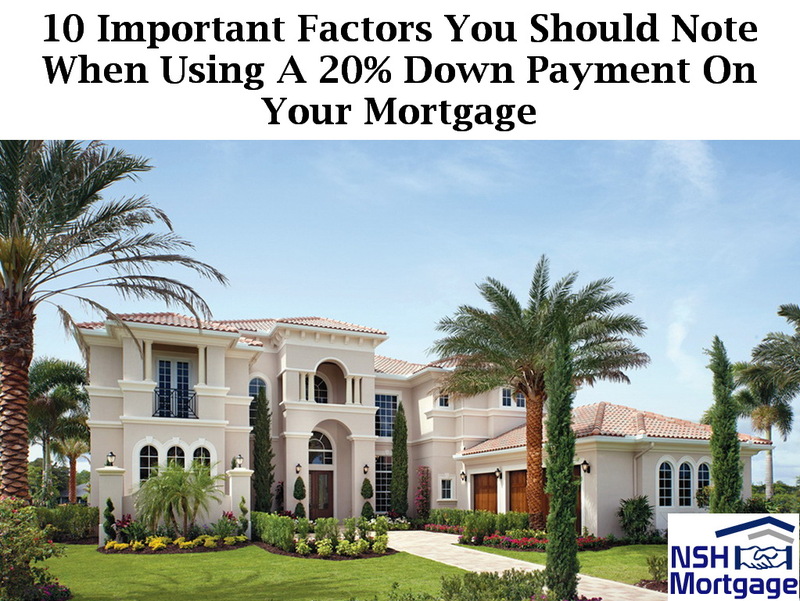 NSH Mortgage has the knowledge and tools that can help you in finding out if using a 20% down payment on your home the best option for you at this time. It may be expressed as a percentage. For instance, it usually takes a 20% down payment to buy a home without private mortgage insurance. It may also be expressed as a dollar amount. As in, you have $15,000 available for a down payment. Loan programs today allow you to choose almost any down payment you would like there are even zero down payment mortgages. So, the question most home buyers face right away is, Should I make a large down payment? Each buyer should come their own conclusion. But it is becoming more popular not to make a large down payment, for several reasons. Why Do Mortgage Lenders Require Down Payments? Down payments are all about lowering risk for the mortgage lender. Statistically, the more the home buyer invests upfront in the property, the less likely he or she is to default on the loan. Therefore, lenders sometimes offer lower mortgage rates to buyers with higher down payments. However, the lenders’ assumption is flawed. VA loans, for instance, require zero down, yet have one of the lowest default rates of any loan type. In addition, the lower default rates among those who can meet higher down payment requirements may have little to do with the argument. Home buyers who can make a massive upfront investment tend to be more financially stable and established in their careers. High down payment requirements may have nothing to do with the fact that they did not default. So, while you might hear that it is more conservative to make a large down payment, it is only partly true: it is more conservative for the lending institution. A large down payment is actually riskier for the home buyer. Should You Make A Larger Down Payment? 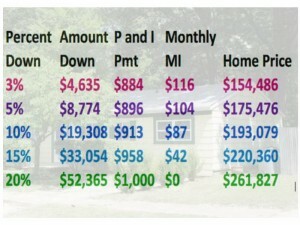 How much should you put down on a house as much as possible. There is nothing wrong with that, while you are not also carrying high interest debt. You might be better off zeroing those balances first. You also do not want to sacrifice retirement funds or your emergency account. Those who pay more upfront, without depleting all their assets, probably should and it saves your expenses from your mortgage insurance. Notably, here are five important things to note when paying off your mortgage early and if it is the best decision? A large down payment helps you afford more house with the same payment. In the example below, the buyer wants to spend no more than $1,000 a month for principal, interest, and mortgage insurance when required. Here is how much house this home buyer can purchase at a 4% mortgage rate. The home price varies with the amount the buyer puts down. Even though a large down payment can help you afford more, by no means should home buyers use their last dollar to stretch their down payment level. It is not conservative at all, for the following three reasons. Just because you can put more money down on your home purchase does not mean you should. The whole point of a down payment is to tie up money in the house. With that money unreachable, lenders say, the homeowner will continue to make their payments. That is not necessarily a bad thing. The money is sitting there for when you sell the house someday. However, a financial event can leave you wishing you had access to the money without selling. Say you lose a job for three months. An extra $20,000 would be a nice safety cushion. Best ways to use your cash-out refinance. Additionally, if you lose your source of income, you cannot take home equity out of a cash-out refinance or home equity line of credit (HELOC). Lenders will not approve a new loan to someone between jobs. In short, the more you need to get at the money, the less access you have to it. A down payment protects the bank, not the home buyer. Home values are tied to the U.S. economy. Usually, the economy is making incremental gains, and home prices rise. But sometimes, the economy falters. This usually happens after extended periods of too hot growth. That happened in the late 2000s. For example, Buyer A: Puts 20% down on a $300,000 home. Whereas, Buyer B: Uses FHA to put 3.5% down on a $300,000 home. Buyer A, thinking he is being conservative puts $60,000 down on a home while, Buyer B puts down just $10,500. If home values fall 20% neither Buyer A nor Buyer B have any equity in their homes. However, Buyer A lost a much bigger amount. Whereas, Buyer B carries less risk of being foreclosed on if she can no longer make her payments. This is because banks know they will take a bigger loss repossessing a home with a larger outstanding loan balance. So, really, which home buyer is more conservative? The one who puts the least amount down. Even if you are a conservative investor, if you want to maximize your return on investment, you will monitor your down payment size. Consider a home which appreciates at the national average of near 5%. Today, your home is worth $400,000. In a year, it is worth $420,000. Your down payment size has no bearing on the rate your home appreciates. In this example, your home is worth $20,000 more. That down payment affects your rate of return. With 20% down on the home, $80,000, your rate of return is 25%. With 3% down on the home, $12,000, your rate of return is 167%. However, we must also consider the higher mortgage rate, plus mandatory private mortgage insurance which accompanies a conventional 97% loan. Low down payment loans can cost more each month. 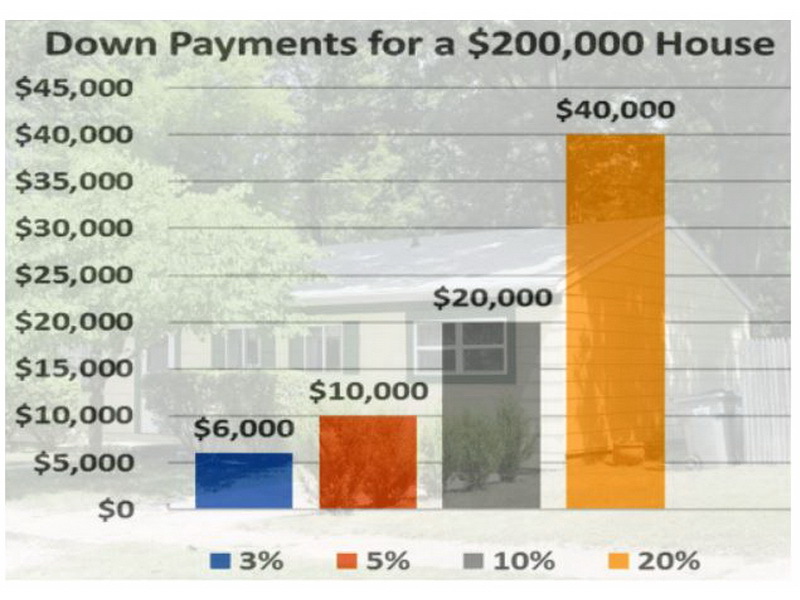 Assuming a 175 basis point, 1.75%, bump from rate and PMI combined, then, and ignoring the homeowner’s tax deductibility, we find that a low down payment homeowner pays an extra $6,780 per year. With three percent down, and making adjustment for rate and PMI, the rate of return on a low down payment loan is still 106%, much higher than if you made a large down payment. The less you put down, then, the larger your potential return on investment. If you have already made a large down payment, you can still decrease your risk with a home equity line of credit. Do it whiles the economy is doing well, lenders are offering HELOCs, and you have a job. If any of these factors evaporate, access to your home’s equity is extremely limited. You can open a zero balance line of credit. You pay nothing in interest until the moment you draw funds from it. It is just like a credit card with much lower rates of interest. For instance, you open a HELOC with a $100,000 limit. You draw nothing. In an emergency, you draw $5,000 per month or as needed, until you are back on your feet. It is a convenient, low cost way of turning your home’s equity into potential cash. In addition, if your home value drops or you lose your job, you can still take cash out. The terms of the HELOC do not change based on home value or employment status. A zero balance HELOC is probably the easiest way to build a financial cushion quickly if you have tapped most of your liquid assets to make a large down payment. What Is My Eligibility For A Low Down Payment Home Loan? When you are planning for a down payment, there are additional considerations beyond how much can I afford to put down. Consider your down payment in the context of your tolerance for investment risk, as well. Get today’s live mortgage rates now. Your social security number is not required to get started, and all quotes come with access to your live mortgage credit scores.